If you want to save yourself some time and effort, my best advice here is to listen to the above three tracks, and skip the rest of the album. This isn’t just because the other songs are merely album fillers; it’s because, for the most part, they are the same song, rehashed again and again to the point of utter tedium – Carol; Sweet Little Rock & Roller; Johnny B Goode; Little Queenie; Jo Jo Gun, and Roll over Beethoven even have the same intro (with the minutest variations). Hey Pedro is the only song that dares to be different, but its truly abysmal tongue-in-cheek lyrics represent the lowest point on a disappointing album that I was bored with long before it ended. 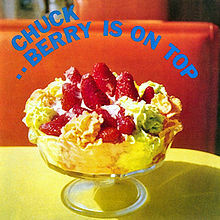 Chuck Berry’s influence on Rock ‘n’ Roll and subsequent artists should never be underestimated. The problem is that Mr Berry is a prime example of where the students surpass their teacher. Check out The Rolling Stones’s cover of Carol, and The Beatles’s version of Roll Over Beethoven for much more satisfaction.